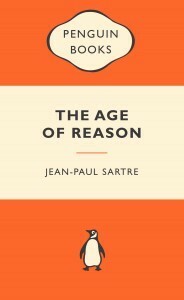 Sartre has a rather intimidating reputation but I found The Age of Reason easy reading. Translated by Eric Sutton and with a helpful introduction by David Caute, this ‘Popular Penguin’ edition seems at one level to be like many another novel. It’s a chronological narrative with fairly orderly narrators giving the point-of-view of the main characters, and the plot is easy to follow. It’s the story of Mathieu Delarue, a philosophy teacher, and his not-very-energetic efforts to find 4000 francs for his girlfriend Marcelle’s abortion. It’s quite interesting: Will he get the money? Who among his friends will he ask for it? What’s his relationship with those he asks? Do they refuse, and why? What then? Will she do something about it? Or does she really want to keep the baby? You could read this book at that level alone and enjoy it because it’s an engaging issue and the novel is well-written and constructed and the translation is good. Paris between the wars is its usual fascinating self, and the characterisation is fun: all sorts of odd-bods for Sartre to manipulate into interesting conversations. This conflict between Mathieu’s desire to be ‘free’ and the reality of his life is so contemporary it’s almost funny. He is like many men today who refuse to ‘commit’ and yet they live like committed men anyway – until the biological clock starts ticking and the woman gets broody. In the meantime they go on with the same sort of irresponsible nonsense as Mathieu, throwing money away on taxis and champagne and paying very little real attention to the women they profess to care about. Parenthood sends this type of man into total panic! Mathieu’s next attempt to get money is Brunet, a mate of his who would like him to join the Communist Party. Once again Sartre shows the bind that Mathieu is in: he’s tempted by the ideology but he doesn’t want to join anything or commit to anything. The spectre of war is looming; the Spanish Civil War is in the wings, but ‘freedom’ for him is this inconclusive ‘not yet’ neverland. But in a world where supporters of freedom should be standing up to defend it, Mathieu doesn’t feel opposed to the impending threats ‘violently enough’ (p122) and he’s sanguine about compromising a long-standing friendship with Brunet too. All the relationships in this story are compromised by this preoccupation with freedom. Marcelle herself takes quite a while to recognise that the freedom she so passionately espouses means that Mathieu is actually imposing his will on her because he never allows her enough time to raise objections; and there is a poignant moment when it dawns on her that it is Daniel who’s the only one to ask her if she wants to keep the baby. The homosexual Daniel is a rather strange character whose motivation for sabotaging Mathieu’s relationship with Marcelle is never really clear, and the Russian émigrés Boris and Ivich are odd indeed. (Mathieu fancies Ivich (his student) but she’s too lost in her own erratic selfishness to fancy anybody; they swan around Paris together but nothing comes of it except some rather bizarre sequences involving self-harm; a dead body that isn’t, and an on-again/off-again theft). What I really liked about this novel though, was the frequent ‘ah-ha!’ moment when the compartments into which Mathieu has organised his life begin to crack; his astonishment when he learns what Marcelle has been up to behind his back is rather droll. The knots he ties himself into are droll too: although he’s a salaried professor he doesn’t have any money because it’s conformist to save up; he tiptoes into Marcelle’s apartment so as not to disturb the woman who would be his mother-in-law as if he were a teenager; and he can’t define for himself what the difference is between bourgeois morality and decent behaviour except to decide that Marcelle should have a safe abortion and not a backyard one. What he doesn’t seem to understand is that it’s her decision to make, not his. Plus les choses changent, plus elles restent les mêmes, n’est-ce pas? I’m a big fan of Jean-Paul Sartre as a novelist – have read the entire trilogy that ‘The Age of Reason’ is a part of, also ‘Nausea’ all of which are superb. A lot of people think that Sartre must be difficult because he is a philosopher, but actually he is quite easy to follow as you say. Hi Lisa. I have just borrowed a copy of The Age of Reason, and hope to get to it in the next week or so, before returning to read your review in full. It is encouraging that you consider him accessible. I say ‘borrow,’ but on my part it was a little more passive, and I was indeed alarmed by the reputation that you mention. With Anna Karenina currently on the go, that is two of your posts I now have on hold! I’ll be interested to see what you think of The Age of Reason, and I hope you’re enjoying AK! Hi Lisa. Now that I am immune to spoilers I really enjoyed your take on the character of Mathieu. My first impression of Mathieu suggested a considerably younger man which was an interesting beginning, as it felt deliberately misleading. I’m glad you pointed out the humour. My over-riding memory is of the rather disturbing Daniel, but you are right. There are some very funny moments too. Lisa, have you read Faulkner’s As I Lay Dying? Another unwanted pregnancy in the era before legalization. No, I’ve read Light in August and The Sound and the Fury but not (yet) As I Lay Dying. Thomas Hardy’s Tess of the D’Ubervilles covers it too, though a bit more coyly. Light in August starts with an unmarried pregnant woman looking for her boyfriend, walking and hitching rides from Alabama to Mississippi. But the woman in As I Lay Dying is seeking an abortifacient from drugstores with $10 given her by her worthless boy friends. Sorry, that should be boy friend (singular) but he also seems to have abandoned her. At least in Age of Reason the “hero” sticks with his girl friend. In both, money is an issue. Lisa, Have you read “Black Elk Speaks”? I know you Aussies are concerned with your own indigenous people (so-called Aborigines); compare U.S. and our Native Americans (so-called Indians). This book is a MUST. Great. Anton, I will be running the annual Indigenous Literature Week in July and I encourage reviews of indigenous authors from all over the world including the US. So if you have a review of this book somewhere, (Goodreads, LibraryThing, a blog but not Amazon) you could contribute it then. (Not now, because I haven’t got a page set up for it).